M&H Industrial Service is a leading millwright and machine erector business serving companies of all sizes and industries in southeastern Wisconsin. We offer complete millwright services for heavy machinery and equipment moving, erecting, rigging and installation. From start to finish, M&H will calculate the most direct and efficient plan for moving your valuable equipment and machinery. The M&H reputation for reliability and excellence remains solid after four decades. Our goal: customer satisfaction—we finish a job safely, on time, and within budget. The M&H millwright crew is a skilled and dependable professional team—ready to transport, replace, relocate and install your equipment and machinery with precision accuracy. We’ll transport one component or relocate your entire business, and manage every detail in the process. 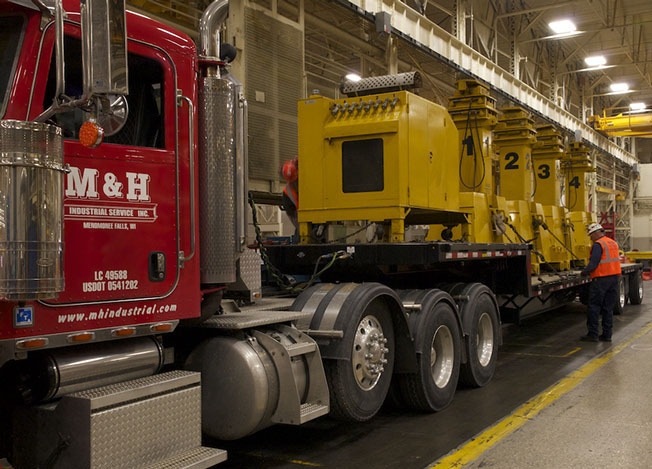 M&H truck arrives with hydraulic gantries—prepared to move and install machinery for a Milwaukee customer.